NEW YORK, Apr. 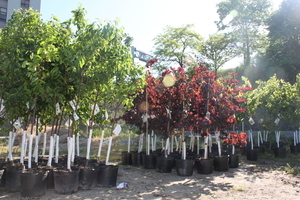 29 /CSRwire/ - GreenStar Hub (GSH) is partnering with New York Restoration Project (NYRP) to host a MillionTreesNYC tree giveaway and promote the giveaway program in New York City, the country's largest municipal tree giveaway program. The program, which is successfully growing with the hard work of participants and generosity of lead sponsors TD Bank and Toyota, and supporting sponsor, JetBlue, is underway with its spring 2014 program. As the largest spring giveaway season, the program has grown by 140% with over 75 local community partners giving away 12,000 trees from March to May. On Sunday, May 11, from 9:30-11:30 a.m., GSH will host its first giveaway in Forest Hills, Queens at 108 Street and Jewel Avenue. GSH hopes to help NYRP meet the common goal of making NYC even more sustainable. TD Bank Mobile Forest truck will also be onsite to feature real plants, photo area for social sharing, and give away reusable bags to participants. New Yorkers can help green the city by planting a tree on residential and commercial properties where the trees can be well-maintained and watered. In addition to providing staff to host the event, GSH will promote the program on its homepage GreenWall (GSH's Green microblog), and invite its vendors and members in Queens and nearby boroughs. GSH will also offer any participating businesses a standard listing in its directory at no cost. "GSH and our network of local businesses are excited to partner with NYRP on its mission to engage NYC citizens and businesses to achieve NYC's green goals. The MillionTreesNYC giveaway program is a great model and an example of how sponsors, tree recipients and NYRP are working together towards a common goal," says Tam Phung, CEO of GreenStar Hub. "We're very grateful to be working with so many local organizations like GreenStar Hub, that recognize the importance of expanding NYC's green canopy," says Mike Duran-Mitchell, NYRP's Director of Giveaways. "We would not be able to reach our goal without the enthusiasm as a well as the participation of NYC citizens who come to take a tree home – invaluable players of our ambitious goal!" Tree giveaway participants care for their trees by properly watering and maintaining them on their own property, ensuring long-term stewardship of trees. Aside providing cleaner air, planting trees has many benefits, including enhanced curb appeal, offset of climate change, cooler temperatures and more. NYC property owners can find the giveaway schedule and locations online at www.nyrp.org/treegiveaways. They can register for a tree in advance as registration is typically available at least two weeks prior to the giveaway. New York Restoration Project (NYRP) is a non-profit organization dedicated to transforming open space in under-resourced communities to create a greener, more sustainable New York City. NYRP is also the leading private partner of the City of New York in MillionTreesNYC, an imitative to plant and care for one million trees throughout NYC's five boroughs. As part of MillionTreesNYC, NYRP partners with community organizations to conduct the largest municipal tree giveaway program in the country. Thanks to generous support from lead sponsors, TD Bank and Toyota, and supporting sponsor, JetBlue, NYRP will host over 90 tree giveaways in the spring season 2014 and hand out 12,000 trees. Visit www.nyrp.org for more information. GreenStar Hub (GSH) is a group buy marketplace and bidding platform for sustainable products and services. GSH serves businesses and governments. GSH maintain databases of certifications, tenders opportunities, building materials and policies. GSH uses its proprietary GreenStar Rating® to assess products verifying reputable certifications the products hold. Certification is awarded once third party certifications are verified. This assessment tool is intended to give the buyer an idea if something is considered green by existing standards. EnergyStar, EPEAT, EcoSense, Cradle to Cradle, UL and LEED are just a few examples of certifications used. GSH technologies also help member communities share best practices and buy together to save. International patents are pending for GSH's aggregated group buy, content management platform, and mobile technologies. GSH licenses these technologies to large corporations and governments looking for custom solutions. Visit www.greenstarhub.com for more information.